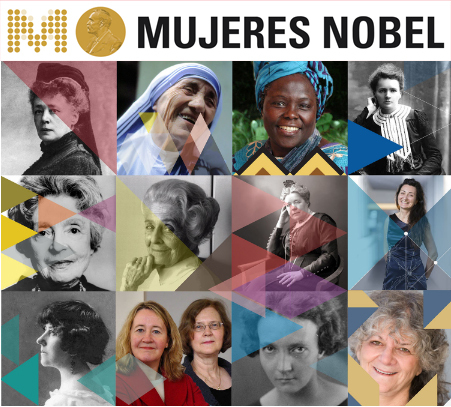 The National Museum of Natural Sciences in Madrid is hosting the exhibition “Mujeres Nobel” (Nobel Women) from September 20, 2017 to March 20, 2018. The exhibition is intended to honour and publicize a selection of twelve women out of the 48 who have received awards in the course of the history of the Nobel Prizes in the different specialties (12 in Medicine or Physiology, 14 in Literature, 2 in Physics, 4 in Chemistry and 16 with the Nobel Peace Prize). The exhibition also includes Alfred Nobel himself, a philanthropist who bequeathed the most prestigious prizes to the world. The main objective of this exhibition is to make known to society, and young people in particular, the women who have fought for an ideal and have become worldwide references in various disciplines, as well as to highlight the fruits of study, effort, teamwork, generosity, social commitment and solidarity; in general, the most important values in the awarding of the Nobel accolades.